Trailhead and parking area are on Rt. 33 in Stratham, NH, 1.8 miles north of Rt. 108 and 3.5 miles west of Rt. 151. Park in the large parking area at Stratham Hill Park. It's hard to find any scenic vistas as close to the sea as Stratham Hill. Located in a cluster of small, steep-sided hills, it has a beautiful view from the converted fire tower on its summit. 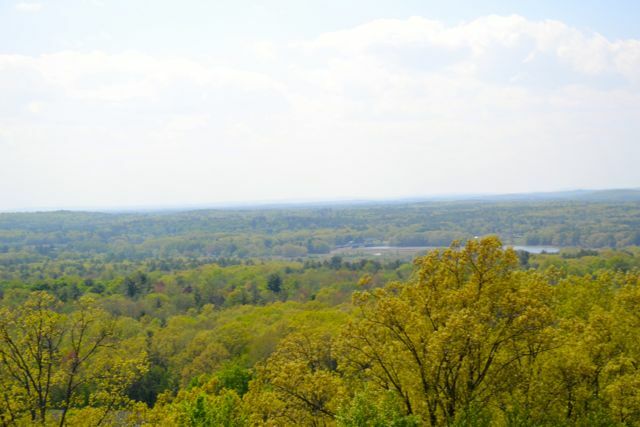 The tower is accessed by a very short trail from Stratham Hill Park. Start hiking on the Tuck Trail, which begins on the left side of the parking areas, behind a kiosk and two rocks. Follow this for 0.1 miles until it ends at Lincoln Trail, a much wider path. Turn left and continue another 0.1 miles to the grassy clearing at the top of the hill. There are picnic tables and an old viewfinder in the clearing. The cab walls on the fire tower have been removed and replaced with railings to make viewing easier. The tower is tall enough to see over the trees to the east, north, and west. Great Bay is close by to the northeast, and the ocean is in the distance to the east. To the north, the Pawtuckaway Mountains are visible.